Arnav Patel is a Y9 student who started at YCIS in K3. His love of learning and gaming has finally come together and the primary students are receiving the benefits through the Minecraft CCA. 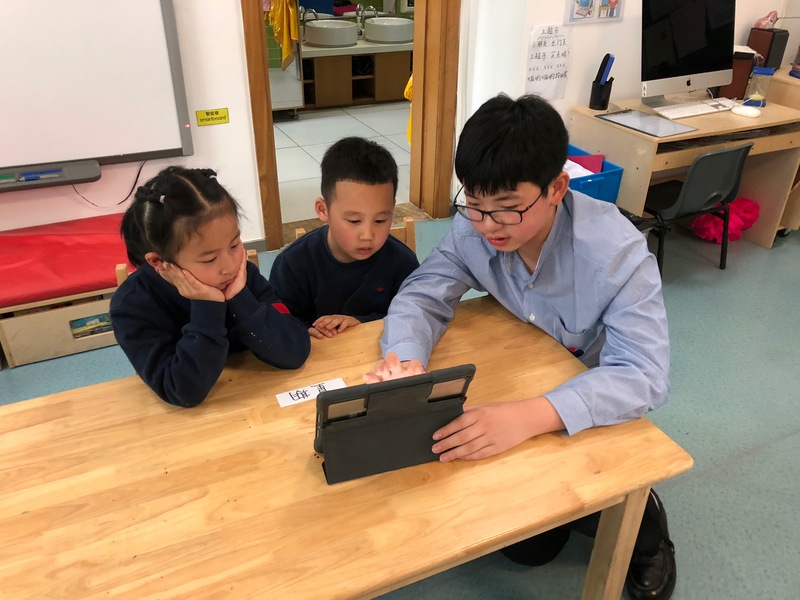 Because his CCA has been so successful, he was asked to be a student presenter at the ACAMIS Spring Conference in Macau this last March to tell teachers and school leaders how he got started and what he’s learned. 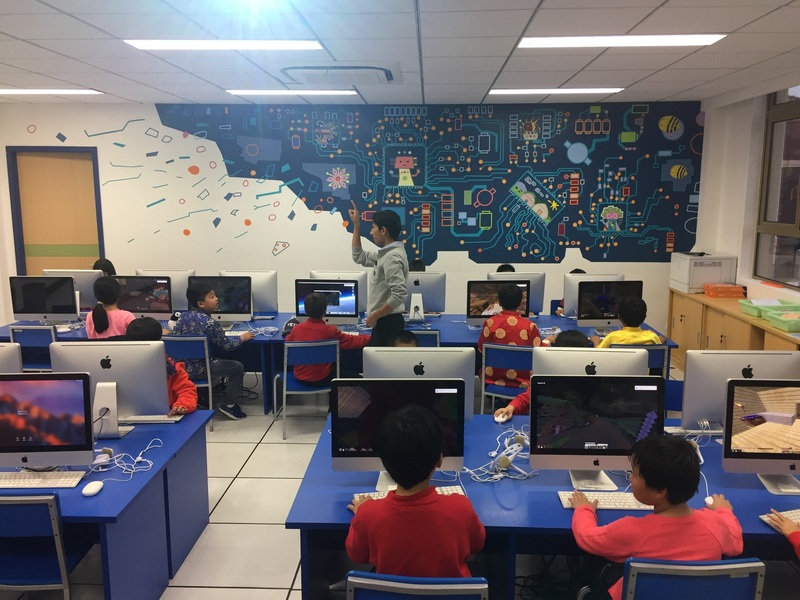 Read more about Arnav’s journey leading the Minecraft CCA below. When and how did you become interested in Minecraft? My interest started when I was about 8. Minecraft was very different to most games that kids of my age were playing, and I decided to give this new game a try. Eventually my entire friend group got into it too, and that was how I came to love playing. 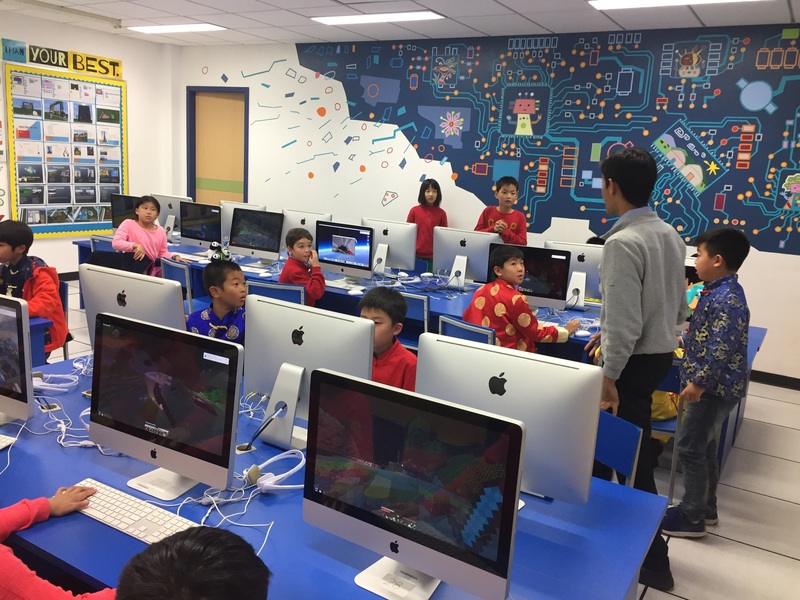 Why did you want to extend your learning and experiences with Minecraft to Primary YCIS students? It initially started with me wanting to earn CAS hours in a different way than just participating in a bake sale or charity drive. I wanted to do something that was both interesting and allowed me to learn something new. 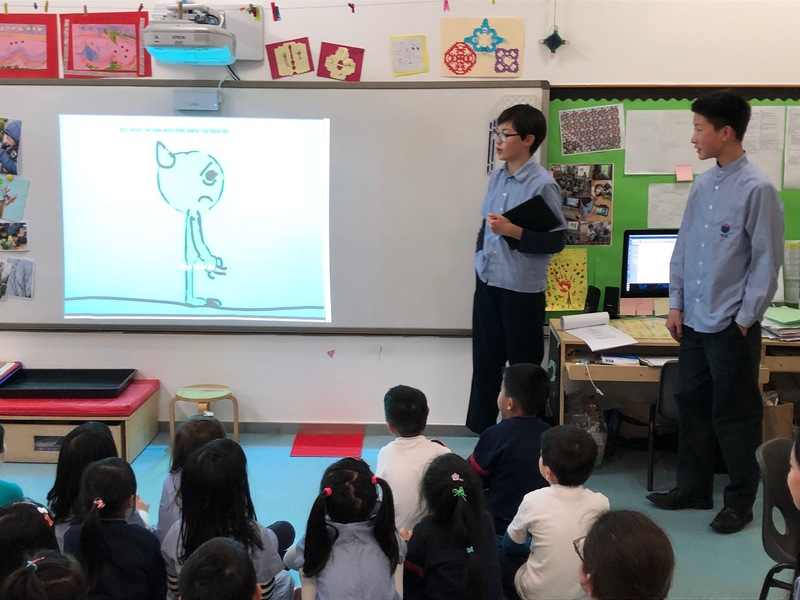 I decided to do this by starting a CCA for Primary kids, I thought it would be something that the kids could both enjoy and learn from. How did you get your CCA started? Even before the first class, I had to make detailed lesson plans for each session. This involved a lot of planning and time to set up my Minecraft world. To plan, I followed the UBD Atlas planning template that professional educators use. It really gave me an inside view of what it’s like to be a teacher. At the beginning, it was pretty hard to get the CCA started, but after a while I managed to get the hang of it. I learnt to just keep it short and simple. 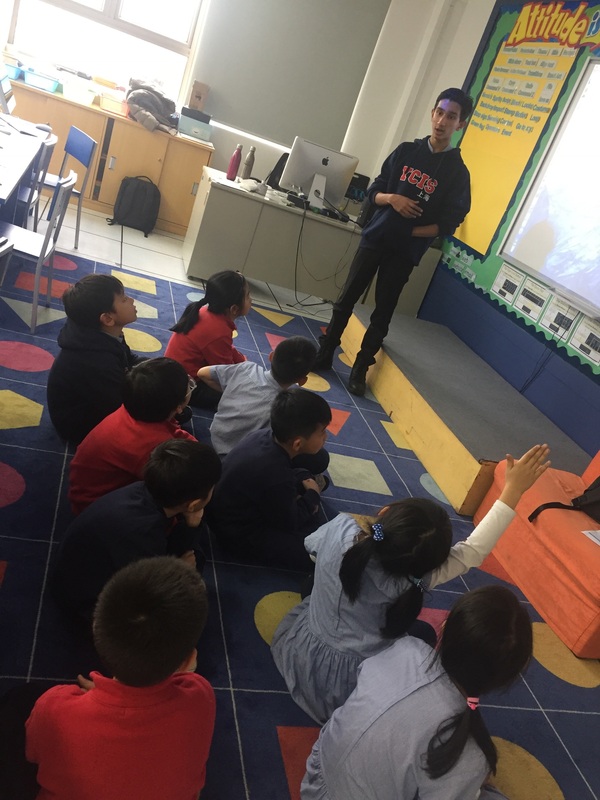 The students would sit on the carpet, I would give a quick introduction of what we needed to do and my expectations of the task. Then it was off to the computers to play. 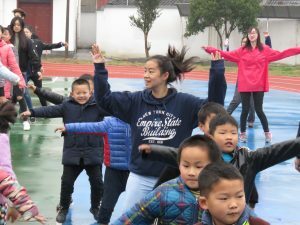 What have you learned about younger children through the CCA? About yourself? 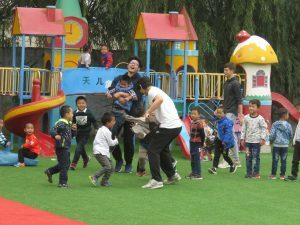 Younger children can, of course, be quite emotional and get mad at each other or the game easily, and sometimes even start crying. I remember there was a time one student nearly started crying because she didn’t find the right colour for building her house. I learnt that the students can be really creative and can do things that I would never think them able to do. A team of students came up and showed me what they were working on and I was amazed. It was an entire castle with dozens of rooms and watch towers, all built by nine students working together. Students’ leadership and cooperation skills really shine doing activities like this. 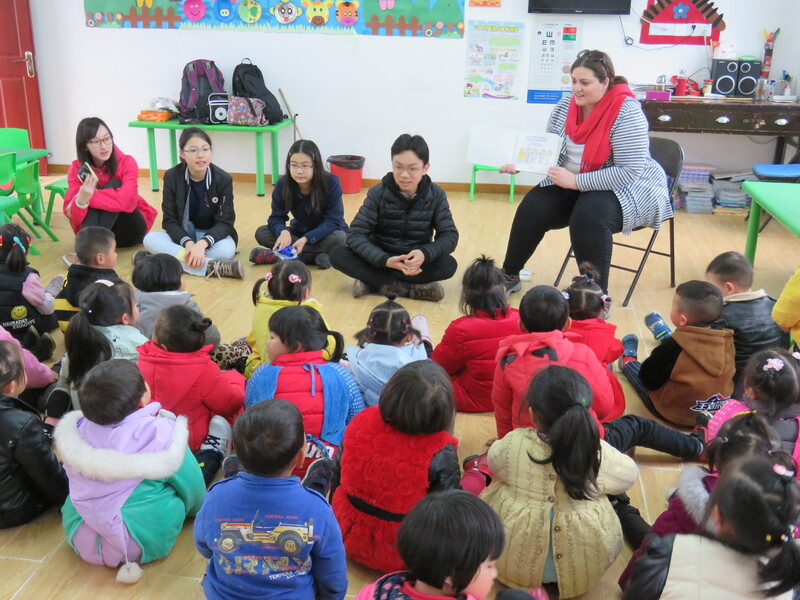 I also learnt that I could be quite patient while teaching and it was a lot of fun too. Can you tell about one experience or interaction that surprised you and why? 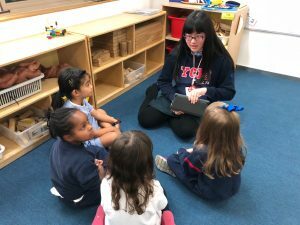 One time a Y2 student was building her house and she wanted to make a bathtub in her house, but in the game, there are no such things as a bathtub. I explained this and told her maybe she would want to do something else. But she was adamant on making a bathtub so I said she could try making one out of the materials that she had. Fifteen minutes later she came to me saying she wanted to show me something. She had managed to create her bathtub using staircases; fences and blocks. 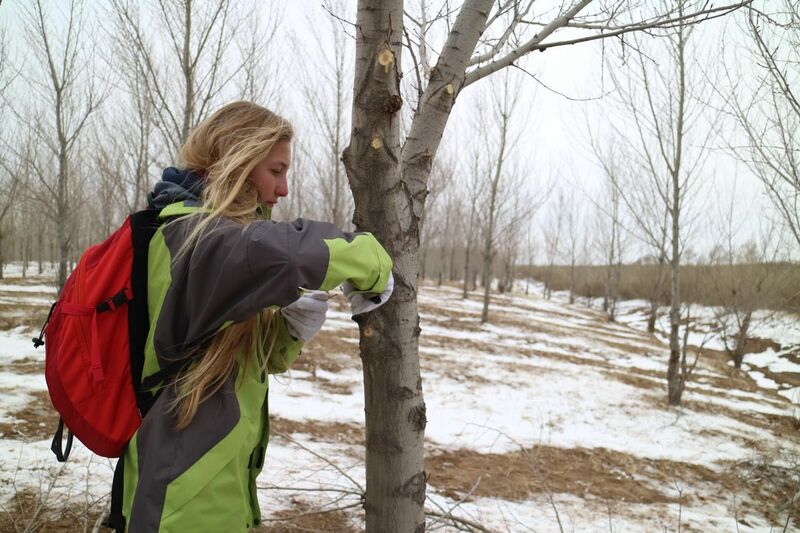 I was amazed on how resourceful the students can be. How will you apply what you have learned during the CCA to future experiences or opportunities? Running this activity has helped me develop many real-life skills. I’ve learnt to manage my time responsibly. 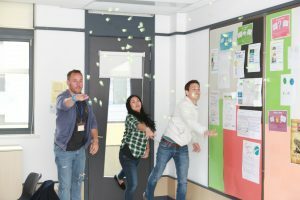 I’ve learnt to troubleshoot and be flexible and resilient as I’ve encountered times when students can’t log in or their computer isn’t working. 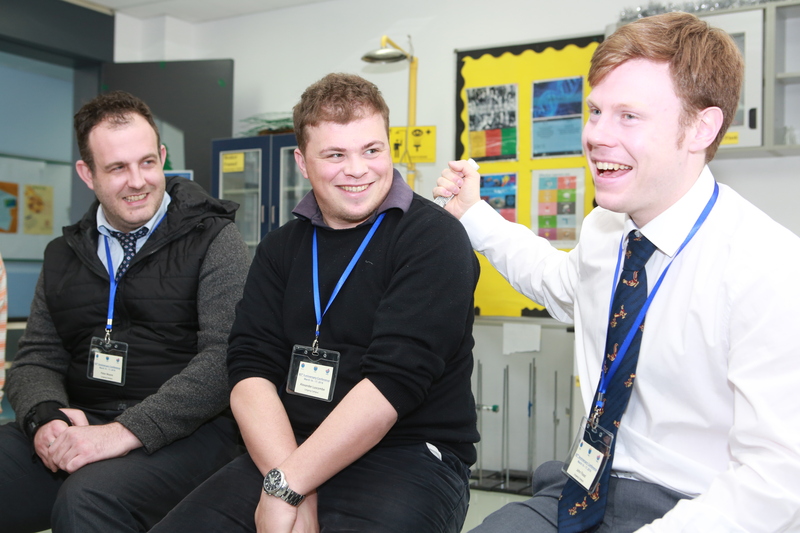 I’ve also learnt leadership skills instructing twenty students in a classroom. Have you ever been a fan of a rock star or a football player? Have you ever admired a person so much that you would like to show your best to please him or her? As for me, the more I am impressed by a person, the higher the pressure I feel to make a great impression on this person. Therefore, in this case, writing this article about Ms Anita has been extremely challenging, because she is not only an amazing teacher who knows how to inspire students and engage them in their learning in art, but she is also such a helpful, modest colleague and a well-rounded person. In addition, she really cares about the environment and tries to make a difference for our planet. Let’s meet Ms Anita Dai, our Primary Art Teacher! Anita, it is such a pleasure to be able to interview you! 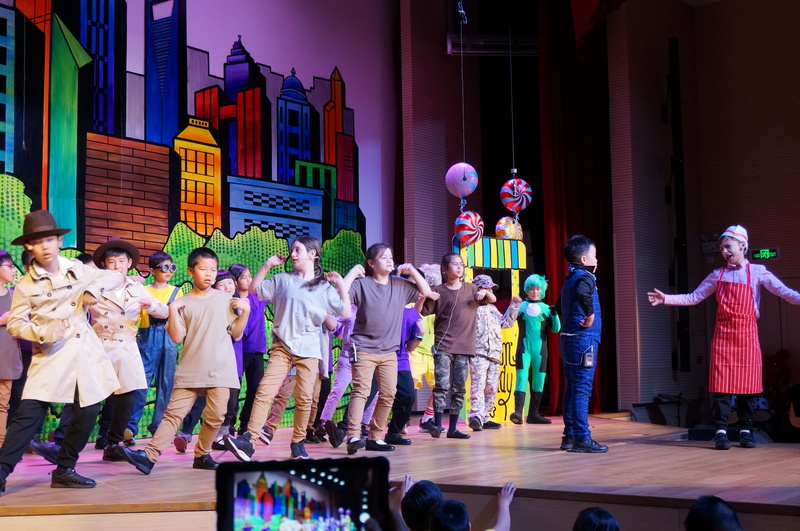 You have been present everywhere through your work for the Winter Concert and Year 5-Year 6 Spring Musical sets, the wonderful Primary Art Show during the Student Led Conferences and now Environment week! 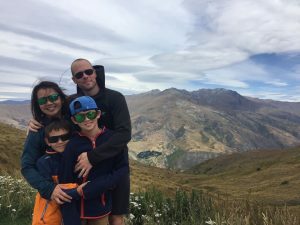 How do you juggle so many different tasks and responsibilities? Roseline, you always praise me so much, it’s embarrassing! First of all, you know that I don’t do all of this by myself, right? I have fantastic helpers, including many of our great YCIS parents who devote their precious time to helping with special projects. For the rest, well, if there’s a project to do, I just do it. I’m not saying it’s easy. In fact, I feel like all I ever do is work or think about work. With so much to do, I really need to stay focused. Just like I say to my Running Club CCA students, willpower is a muscle that you need to exercise and train regularly. Even when you are tired and you think you cannot make it anymore, if you have that mental willpower, you will just make your body finish the run. Oh, wow! I forgot you were also doing that. You are involved in so many different projects at school and outside of school, professionally and personally. 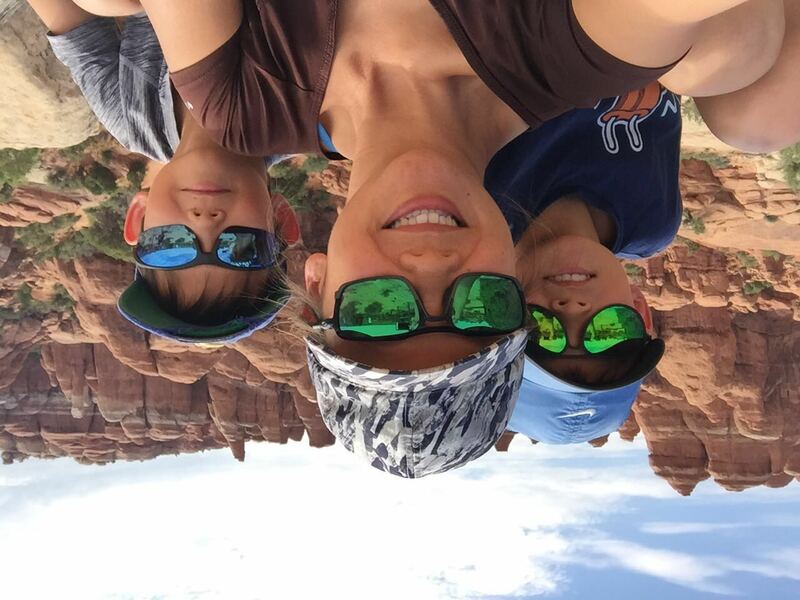 I know you will tell me that you work with the amazing Amy Chu and that you receive the support of all the incredible parent volunteers…but you are also such an amazing teacher, a talented professional, and a great parent for your two sons. 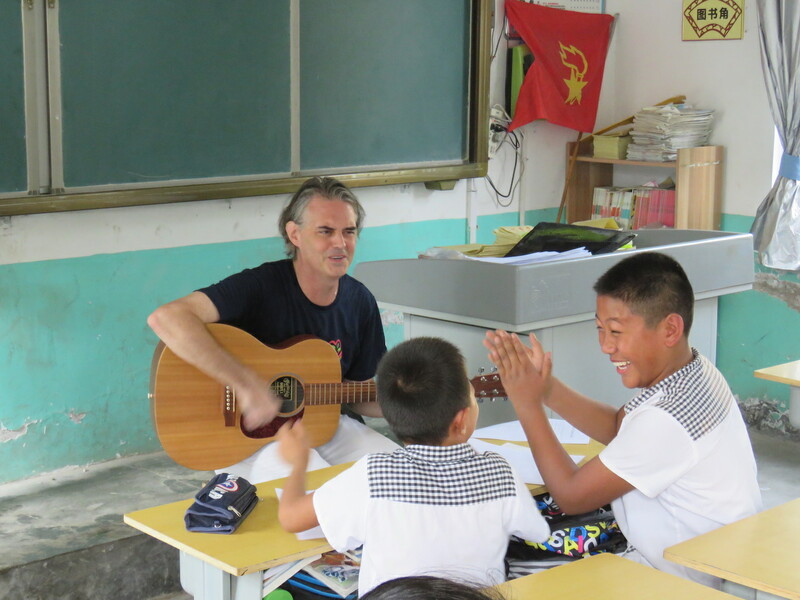 You teach, you paint, you run, you sing. I mean…how do you do all of that? And especially, how do you look so relaxed and happy all the time. Roseline, you are so funny. You make me sound like I’m some sort of superhero (laughs). Well, I have been reading all your Staff Focus articles in the newsletter. So, I know what you might be looking for. Let me share with you my story. You will see that I am just a normal person. 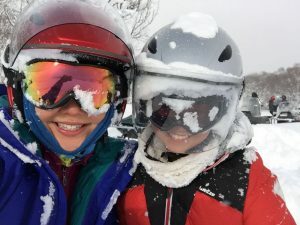 I was born in Taiwan but I grew up in the USA. I am from Maryland. I come from a modest family and I was the youngest of three children in the family. My grandmother was a Chinese painter and teacher. So, I was painting even before I could write my name. Let me rephrase. I was painting, but not well. This, I need to emphasize. So, you haven’t always been an artist? Well, not really. Actually, compared to my two older sisters, I was kind of the black sheep of the family. I was just the wild child with different ideas. Family and friends would make fun of me, especially when they were comparing me to my sisters who excelled at everything they did. They were great musicians, perfect students. 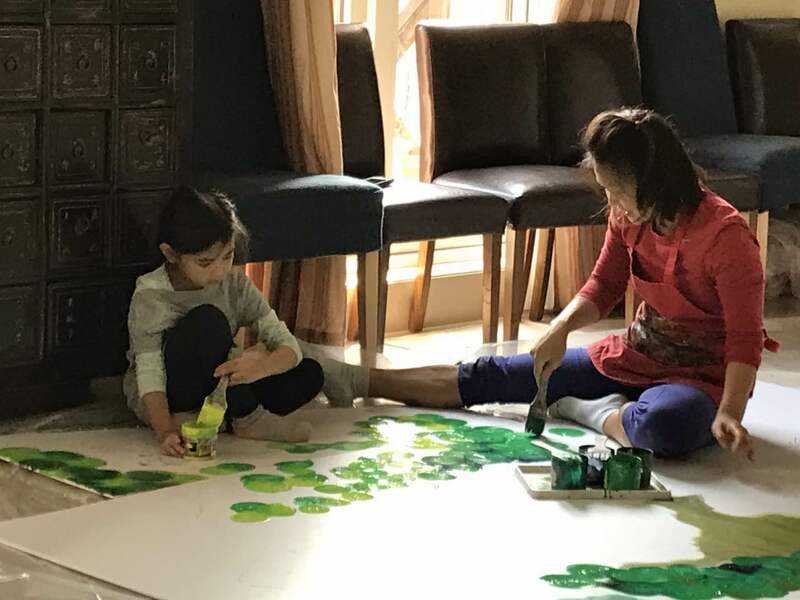 They could also draw and paint so precisely, while I’d be making a total mess on my papers. So, how have you become an artist? Actually, my mom was my best supporter. I wonder now if I really showed promise as an artist or if she just praised me to counteract the negative effects of what I heard others say about me. When I was little, we couldn’t afford many toys, so my mom set up an art table for me and let me paint and colour right in the living room. Also, instead of focusing on my sisters’ ability to colour inside the lines, she praised me for choosing strange and unusual colours and never told me I needed to stay inside the lines. How did you come up with your ideas for the beautiful presentation of everything, especially the cupcakes display that highlighted the student artwork so well? This is a process. When I am making preparations for the Art Show, I spend a lot of time thinking and planning out every section. I think about it when I bike to and from school. I think about it when I go for runs. I think about it when I’m sleeping. I talk to Amy (my assistant) or Federica (supply Art teacher) about it. Then they think about it all the time too! Just like I tell my students about doing Art, it is truly a process of trial and error. Taking the cupcakes display as an example, what I did was to take all the random pieces of trash I had in my storage and set them all out on a big table. I had coffee tins, egg crates, yarn, fabric, cardboard, empty plastic containers, foamboard . . . I tried combining a lot of different things to see what worked and what didn’t look quite right. Actually, before I ended up with the final version you saw at the show, I had spent a long time trying out about 10 different versions that I later dismantled. The perfect combination of shape, color and texture is never something that can be conjured out of thin air. 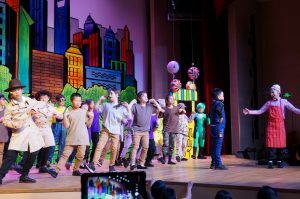 The week before, you were busy setting up the backdrop for the Spring Musical, and the very next week you had one day to set-up the Primary Art Show! How do you do everything with such attention to detail? None of this would have been possible without the help of my assistant, Amy Chu. Also, I owe a big debt to the amazing parent volunteers at YCIS who had been working for over a month to help mount the student artwork. When did you arrive in Shanghai? What made you go to Shanghai? Back in 1999, I followed Iain, my husband, here as a trailing spouse. The contract was for 1.5 years in Beijing. Obviously, things worked out differently from what we imagined . . . I like to spend time with my family. 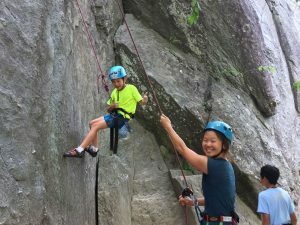 We all like similar things: reading, running, rock-climbing. On weekends and holidays, we like to go hiking, swimming, and rock climbing. As much as possible, we like to be outdoors doing active things such as stand-up paddle boarding, back-packing, white-water rafting and anything else thrilling. When did you join YCIS and what brought you to YCIS? 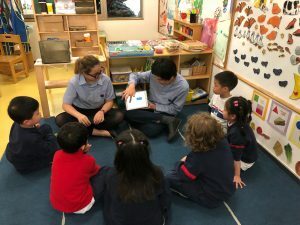 I joined YCIS in 2008, and at first, I worked as a long-term supply teacher in a Y1 class. 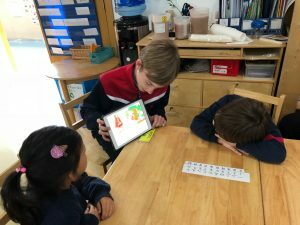 When my older son, Zeke, was ready for Y1, I had the opportunity to join YCIS as a part-time Art teacher. A few years ago, I decided to go full-time. Happily, I have been able to teach Art to both my sons. Oh yes, what is your education background actually and what were you doing before? Well, let me just say that, much as my parents anticipated, if you study Art in college, you might end up selling ice cream when you graduate. I also have a MA in Chinese literature. Sold smoothies after that degree. Finally, I had some sense and studied Special Education. Unfortunately, the day after I graduated with that MA degree, I boarded a plane to follow my husband to Beijing. Thus, I have never really worked as a teacher in the US. I did teach at both ISB and SAS, but by far, my favourite school is YCIS. What do you like about YCIS? I love the school community. 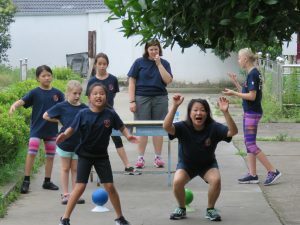 Expat families choose this school because they’ve made an active decision to make their children global citizens. 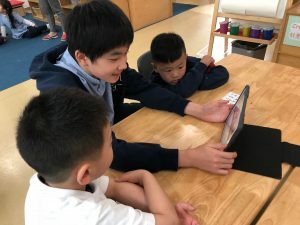 The Chinese language teachers and co-teaching system is the main reason I chose to send my boys here, but since working here, I’ve discovered that there’s even more to like about YCIS. The teachers work so hard and really care about each individual student. The administration is so supportive and the children are happy, well-behaved and enthusiastic. Last question! 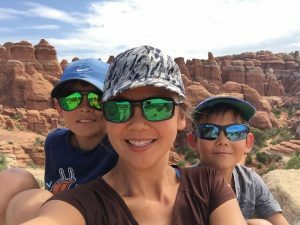 What advice would you like to share with parents? I’m always worried about parents’ tendency to focus on the end product. In my mind, what really counts is the process through which the students go while they are creating a piece of art. Usually, when someone only sees the end product, they don’t understand what learning went into it. Yes, I totally know what you mean (giggle). It’s like me last year when during Parent Teacher Interview you told me about how special my daughter’s drawing was, while I had just been focusing on the fact that it was not finished yet and I was comparing it with the more finished-looking works of other students. In art class, students are not provided with erasers. There is no one right answer when making Art. What we perceive as mistakes are simply opportunities to practice the problem-solving process and explore different possibilities. Thank you so much again for all your time and talent! Fight climate change and stop deforestation by planting oxygen-producing trees! This describes the Million Tree Project which YCIS has supported for many years. This article , written by a group of Year 12 boys and girls, recounts their amazing experiences during the four days they spent planting trees in Tongliao, Inner Mongolia. Day 1: We flew from Pudong Airport at 8.00am and after landing in Shenyang Airport we met up with all the students from other schools for the first time and took the bus to our hotel in Tongliao, a four-hour journey. At the hotel we were welcomed with dinner and a show. We were treated to lots of traditional Mongolian food, with local musicians playing in the background. We ended dinner by taking part in a local ritual as a sort of ‘welcoming’ for us as guests. After dinner, tired from our long journey we decided to call it a night and headed back up to our rooms. 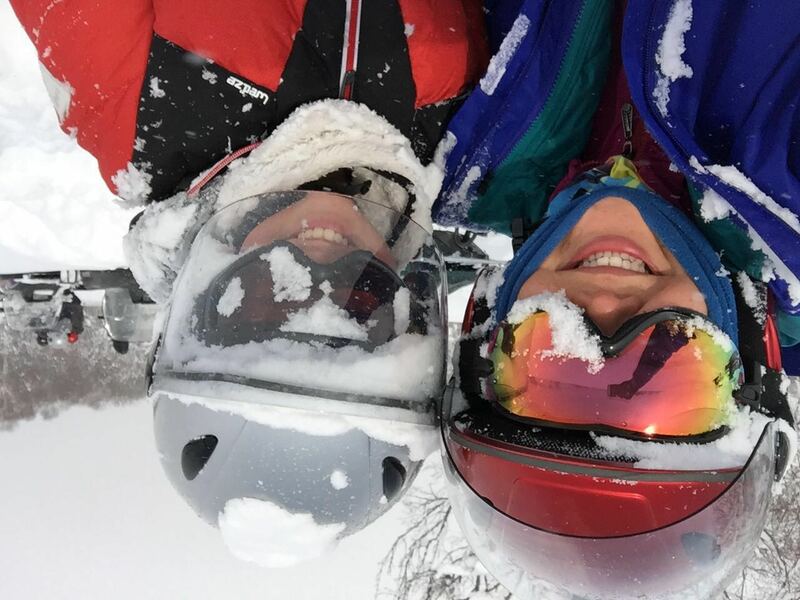 Day 2: There was snow everywhere and the temperature was -2C; great start to the day! 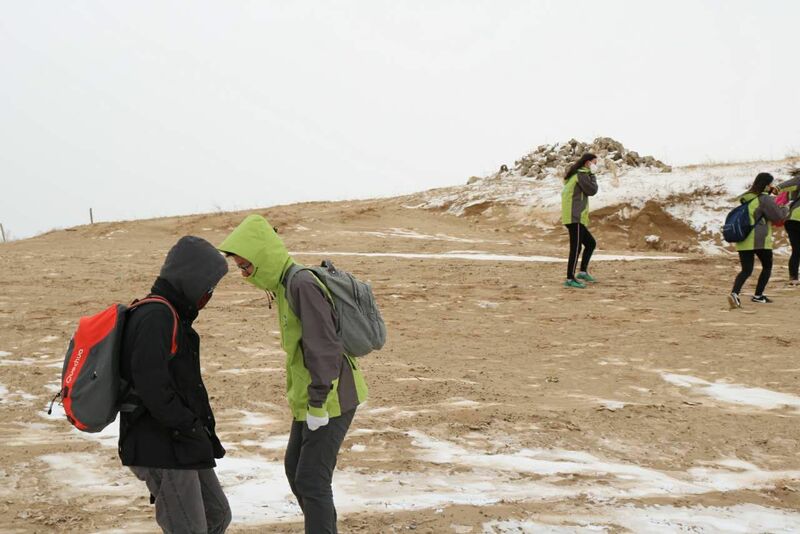 After a nice hot breakfast and a 2 hours ride by bus, we found ourselves in the desert. 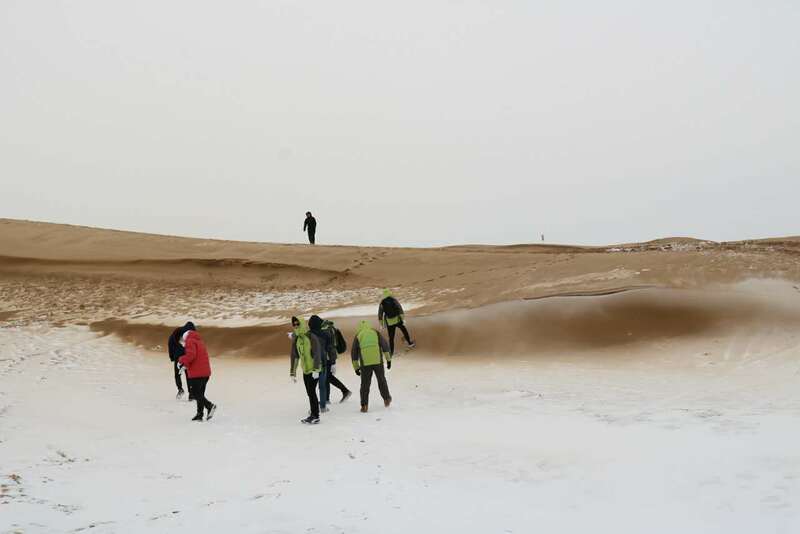 We spent an hour and a half walking in the desert and experienced the harsh conditions first hand…. very tough! After that, it was lunch at a local restaurant where we again ate traditional food. This was followed by a talk on deforestation and the importance of planting trees to stop soil erosion. 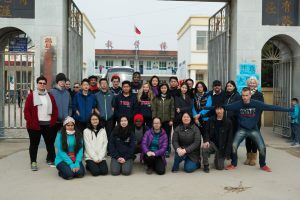 We werethen off to visit last year’s planting sites. When we got there, everyone was given tools to trim branches off the young trees. All of us worked very hard and the task was completed in no time. It was then back to the hotel for a well-earned rest. During dinner we had a great time talking and laughing with the boys and girls from the other schools. By 9.00pm we were ready for a good night sleep. 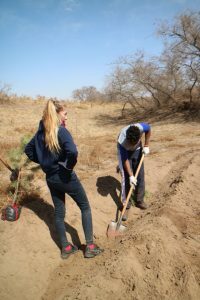 Day 3:It was a nice sunny day, and we were all eager to get going on planting trees. 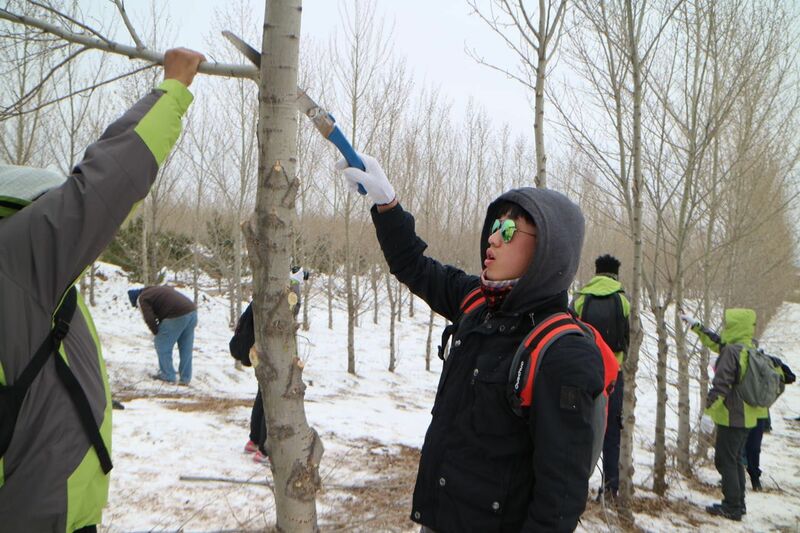 By midday, we managed to plant 250 trees and by the end of the day we were up to 480 trees. It was amazing how much we managed to get done in those few hours and how much of an impact we made. Day 4: Departure day. Sadly, it was time to say goodbye and go back home. 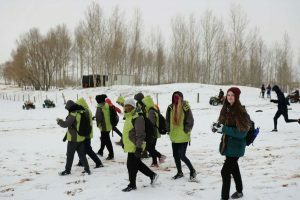 We had four brief yet exciting days, where we did made a contribution towards the environment and have gained a fuller understanding of what the million-tree project is about. When our Music teacher, Ms. Skingley walked into our classroom one morning, I could tell that there was a new bounce in her stride. 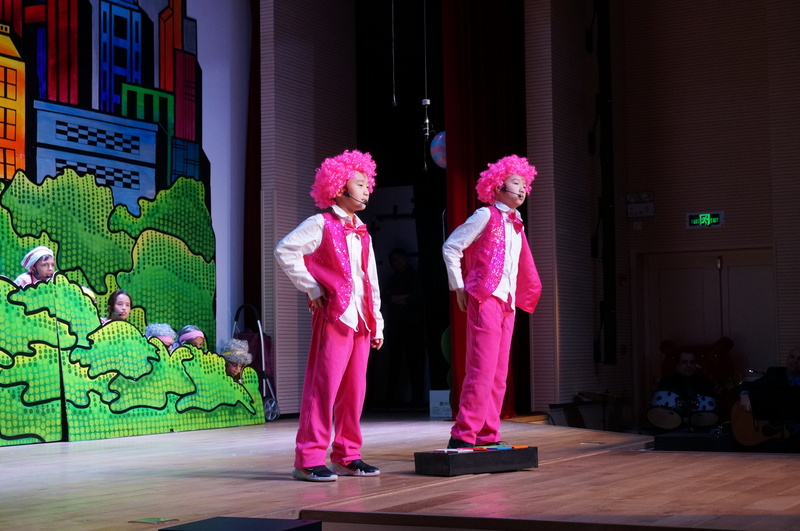 Then she told us: auditions for the Spring Musical were nearing; anyone interested in trying out follow her outside the classroom. A low murmur broke out through the class. Slowly, I pushed in my chair and, along with some other kids, went to go join my teacher outside. Leading up to auditions was and is scarier than actually performing. Walking into the audition, I shared a nervous but excited air with the rest of the to-be cast. We played some games, and shortly began the auditions. We read parts of the script aloud, each speaking as the character we were trying out for. Tryouts flew by like the wind on a chilly winter day, which described the weather as we left school then, the wind in our faces. Time slowed, however, in the weeks before Christmas; every last one of us was desperate to know if we ‘got the part’. One lunchtime during our rehearsals for the Christmas Concert, the Director, Ms. Livermore, called us together. As the list of roles was announced, each was followed by numerous squeals and groans. When my name was called, I sighed with relief. Christmas came and went. Each rehearsal seemed more intense than the last, each more exciting. 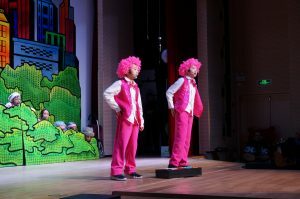 Being on stage gave me a leaping feeling inside, and the show was really starting to come together. I just didn’t realize how soon I would be on stage, performing. Before I knew it, I was already sitting in a chair, in costume, makeup being applied to my face. Our first show was starting in one hour. We walked single file, heading towards backstage, and for the first time, my smile faltered. Would everything go smoothly? Just then, the houselights dimmed. An overture began. And just then, I smiled, restraining myself from peeking out onto the stage. In the blink of an eye, the show was over, and the cast was assembled on stage, singing the last chorus, a sea of colors and people. I couldn’t stop smiling; no one could. And the lights were extinguished. That was my experience of the Spring Musical, Superstan. 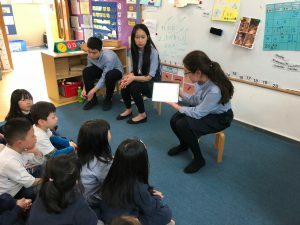 The K4 students were very excited to recently host the Year 8s for an afternoon of reading together. 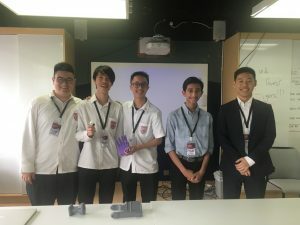 The Secondary students are interested in Project Based Learning, the idea being that the students work together to produce something that not only builds their English skills, but also focuses on 21st century skills, such as working as a team, effective communication, problem-solving etc. The ideal scenario is that the final product is trialed in a real-life situation. So our Year 8 students had to work together to decide what sort of story would interest a K4 child, research the kind of language that they would enjoy in a story, think of ways to illustrate it, write and re-write it. They had to focus on writing for this particular audience and make sure it was entertaining. The trip to K4 was not only to see if they’d been successful, but also to develop their communication skills. The project also involved writing an email to the ECE Coordinators, building formal writing skills, as well as writing an imaginary blog post giving advice about writing for young children. The next step is reflection, with an emphasis on What Went Well and Even Better If. We’ll also be focusing on the Learner Profile to see what 21 Century skills they’ve built on. It was nerve-wracking for the Secondary students to read their stories to the K4s. They were very nervous and at first they held back a little and were shy. 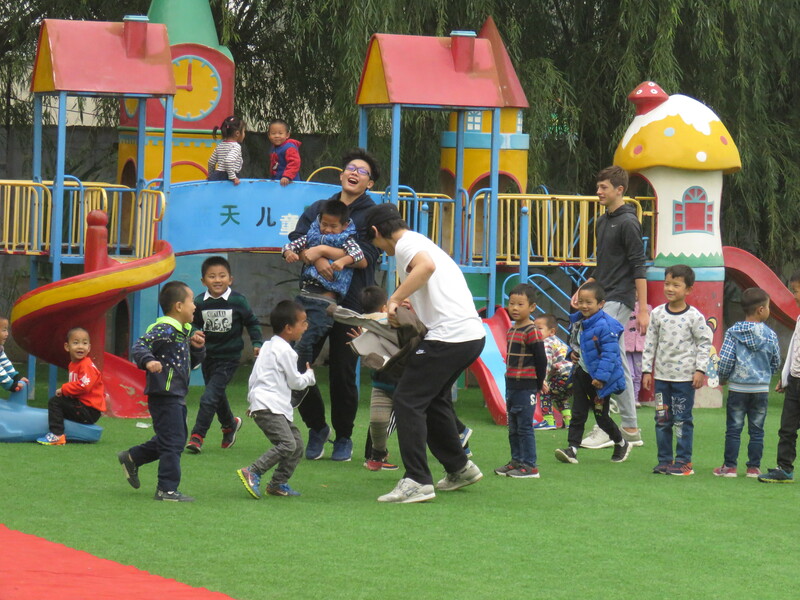 However, after a while they relaxed with the K4s students and everyone had an afternoon of bonding over stories. 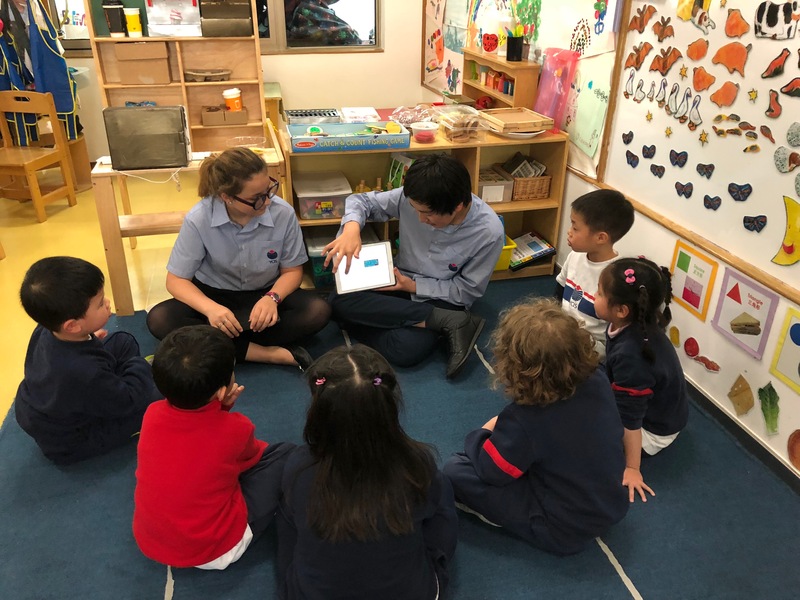 The bus back from RP was full of chat about the different children they’d met, and the K4s were all very eager to share their experience with the Secondary students with their families. Coming together as a community of learners is something that is important at YCIS and something our younger and more experienced learners will always remember fondly. 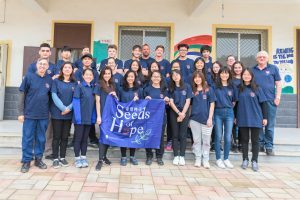 Last month, Steve Hackman, Head of the Christian Community Development Division (CCDD), based in Hong Kong visited our Shanghai Campuses to raise awareness of the Seeds of Hope Project in the Philippines. He met with Primary and Secondary students, staff and parents. 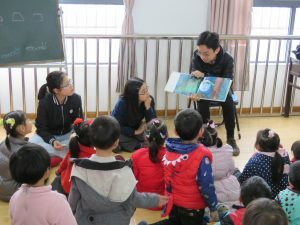 This project will support, fundraise and serve the construction of a secondary school building for Cuatro Christian School (CCS) in a precinct of Manila in the Philippines. 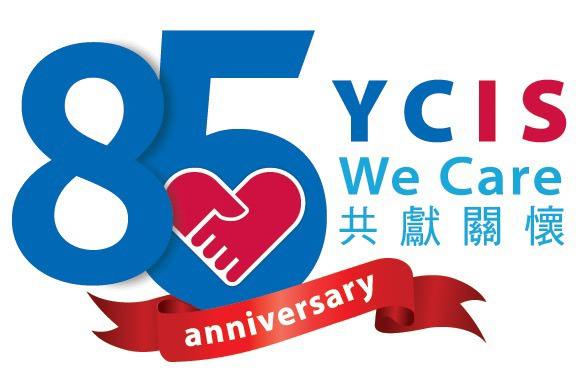 It was chosen to reach a wider community outside of China to celebrate Yew Chung Foundations’ 85th Anniversary. The Seeds of Hope concept was born out of the overwhelming tragedy of the Sichuan earthquake in 2008. 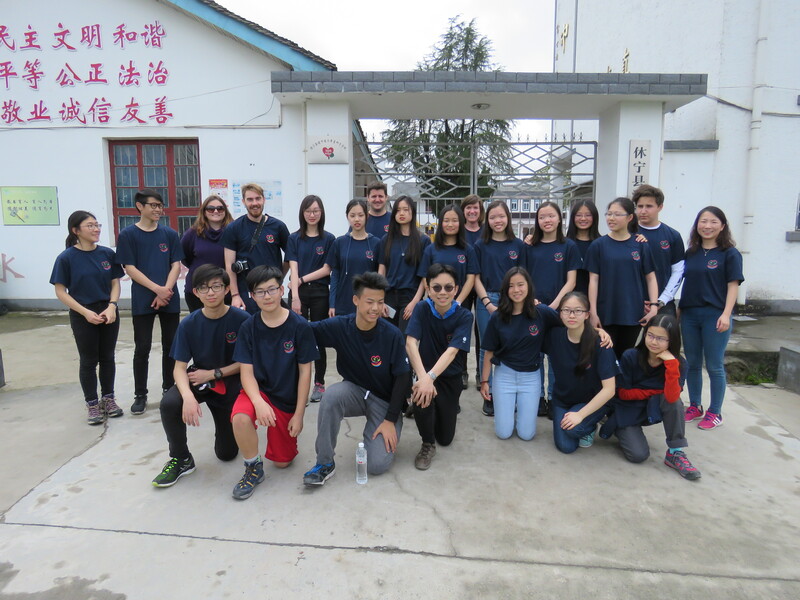 All Yew Chung International Schools (YCIS) responded wholeheartedly to the humanitarian needs resulting from that devastating earthquake. 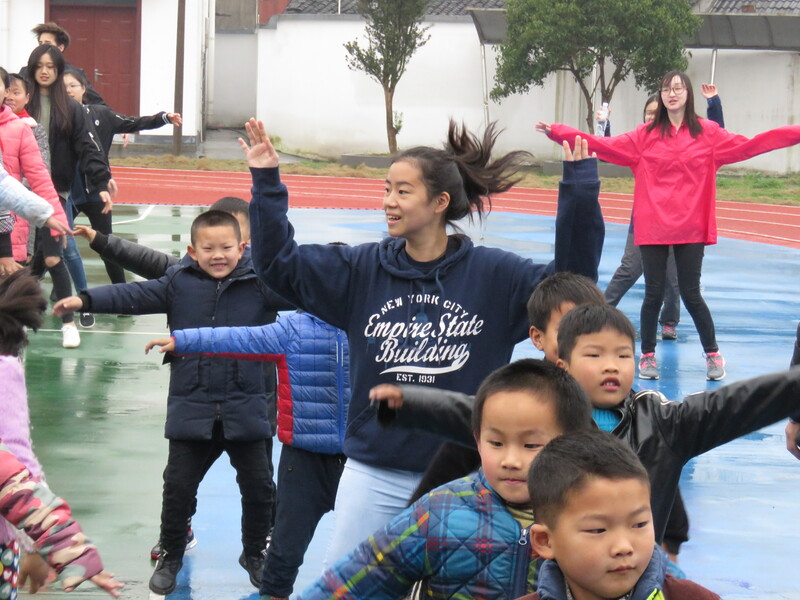 With the funds collected by our students from all YCIS campuses, we created SEED, Sichuan Earthquake Educational Development, to channel the funds into the restoration of the Minzhu Primary School in Anyue County, Ziyang City, Sichuan Province. 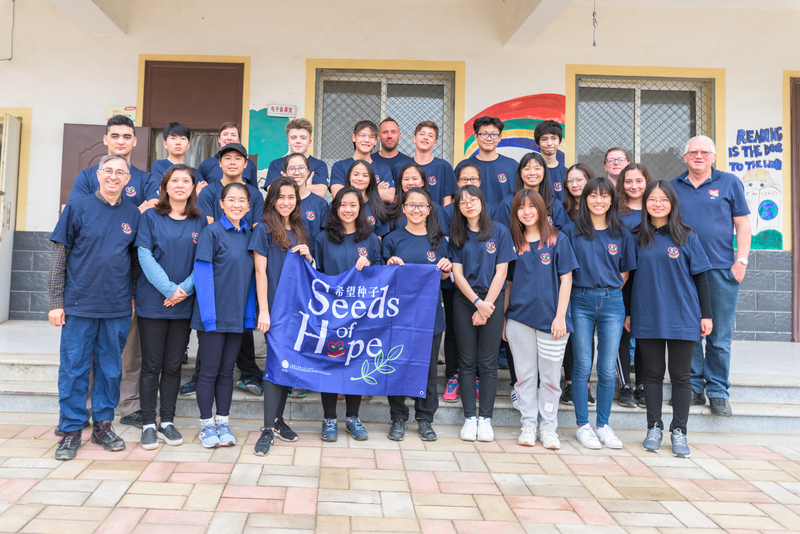 The Seeds of Hope project is an investment in the future of our students – instilling in them good character and teaching them the importance of helping us and giving back to the community. Taking part in this project is a learning experience for us to help plant a seed and watch it grow. ” We are able to bless others as we have been blessed. These schools remind me of my roots as an immigrant from Cuba to the US. My family and the families from these schools have a lot in common. 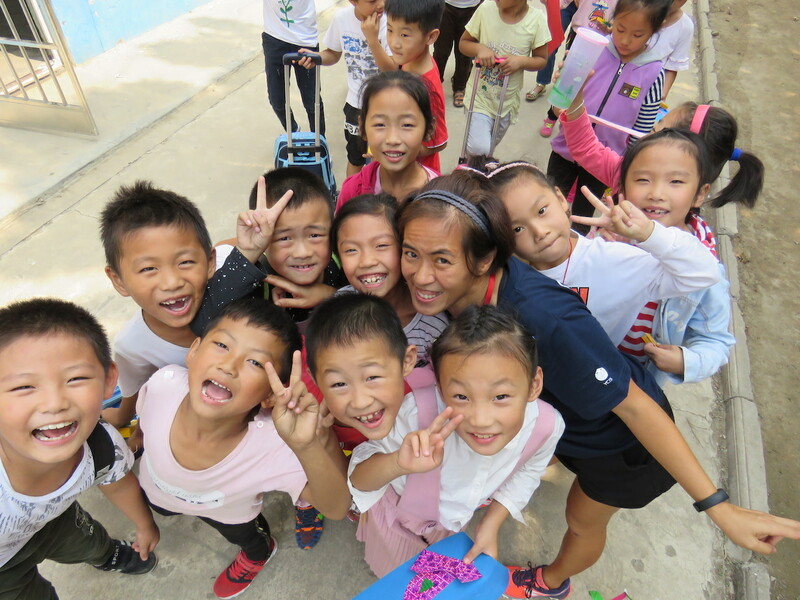 As a result, I am very comfortable being around them and spending time with them. 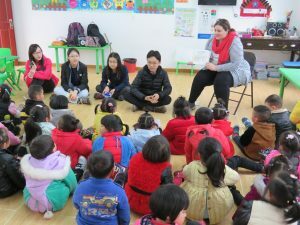 I have been involved with these trips since the very first Seeds of Hope trip to Anyue, Sichuan in 2010. 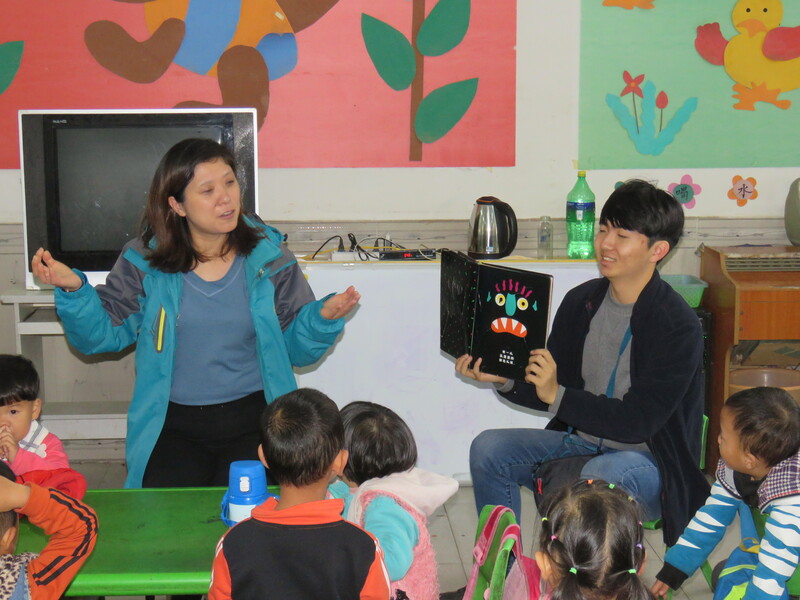 And every trip brings a new experience because children are different and some of their lives have been improved. 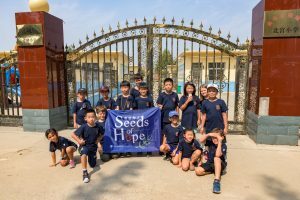 How can you contribute to this Seeds of Hope Project? 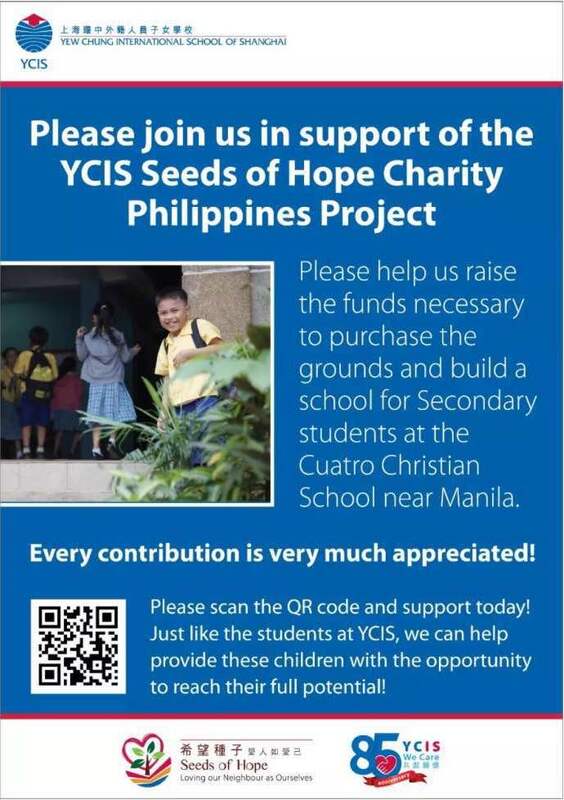 We would appreciate any donations to the Seeds of Hope Philippines Project. If you would like to donate, please use the QR code. 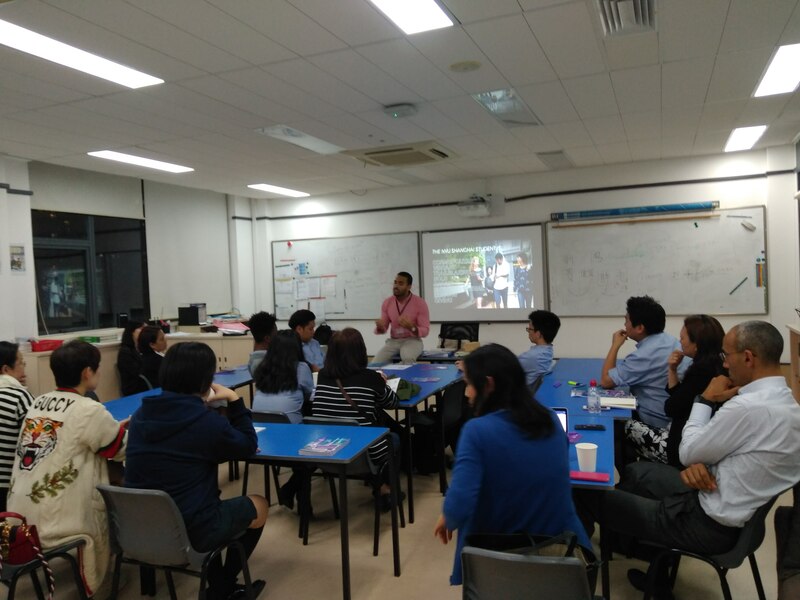 March 14, saw our Century Park Campus hold its first annual University Preview Night for all Year 12 students and parents. This event provided an overview of the university search and selection process and steps students and parents can take now to ensure success. 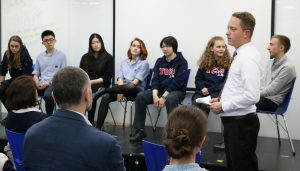 There were three components that made the evening truly special: an overview by our University Counselor, a Year 13 student panel discussion and university break-out sessions in adjacent classrooms. 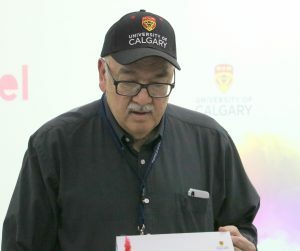 Mr. Timothy Gartz, MSW LCSW emphasized the value of a YCIS education that is unique in its individual attention and the quality of teaching and learning in our international curriculum. He shared the importance of finding university cultures that match student interests and to go beyond name recognition in finding university programs that align with career goals and personal aspirations. 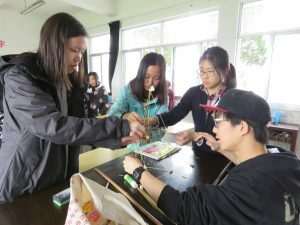 Students can then craft their applications in a way that demonstrate their knowledge, interests, and preparation to the world’s best university programs and faculties. Yet, the highlight of the evening in many ways was the Year 13 panel discussion. As Yolanda Wang and Mary Lu point out: “The best part of the night was receiving direct feedback from our fellow classmates about application strategies and what we can do to avoid mistakes:” The panel consisted of: Annie Ieong, Anna Xie, Elizabeth Robinson, Florencia Darino, Kenneth TNG, Lorenzo Cavalleri and Sharon Chen. 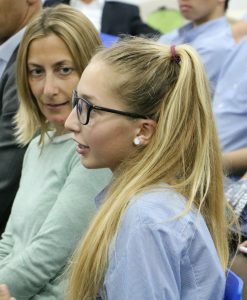 Each offered their choices in university programs and their university acceptances (eg. 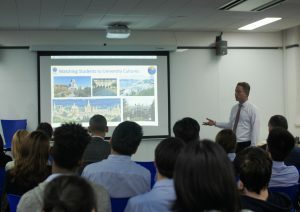 University College London, New York University, McGill University and The University of Hong Kong) before answering questions from students and parents. The discussion became lively as Year 13 students shared their successes as well as some of the pitfalls to avoid in their applications such as how to create a university list, meet application and financial aid deadlines, and write quality essays and personal statements. Following the panel, we enjoyed a short intermission before participating in classroom presentations by The University of Calgary, NYU Shanghai, The University of Hong Kong and The University of Nottingham and Birmingham in the UK. Students came away understanding how to apply and the unique programs and student life opportunities on these campuses. They now turn their attention to creating university lists while focusing on their college essays, recommendation letters, meeting college testing requirements and performing their best in their IB courses. 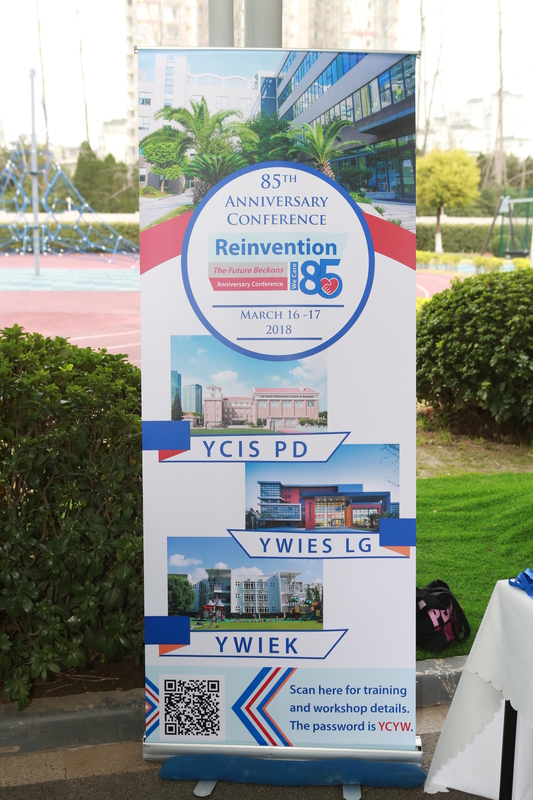 The two day Conference in March was a celebration of the 85th Anniversary of Yew Chung and Yew Wah Schools. 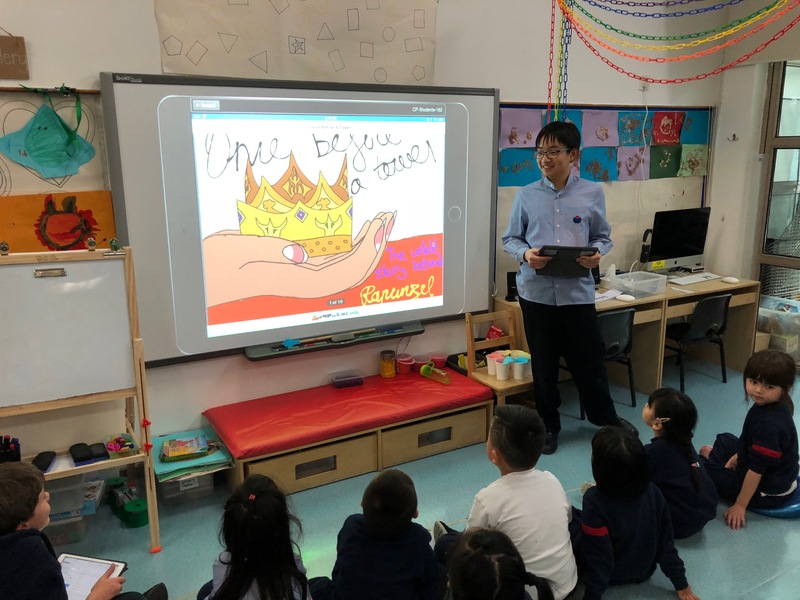 Over 1200 teachers participated in various locations across Hong Kong and mainland China, with the theme being: ‘Reinvention: The Future Beckons’. 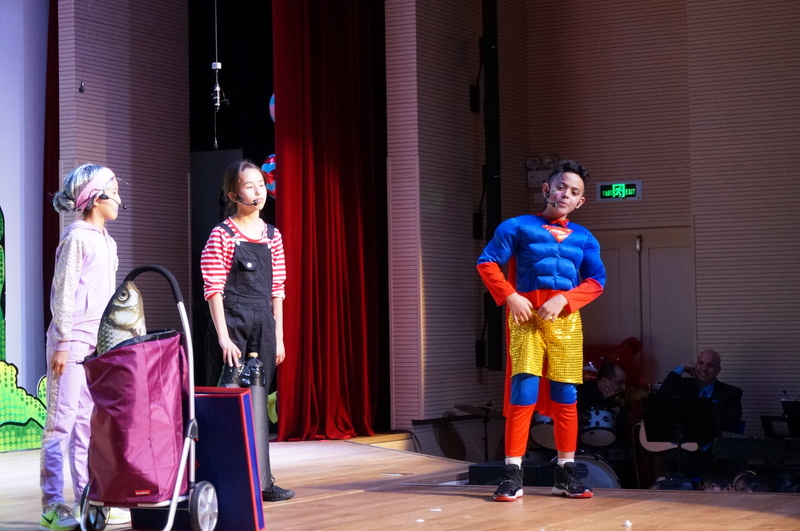 This theme highlighted that we, as a school, need to constantly focus on the future and the skills and competencies our students will need to prepare them for that future. The theme also represented YCIS’ stated mission to pioneer educational pedagogy through the introduction of ‘Learning Communities’ and a focus on global competencies. 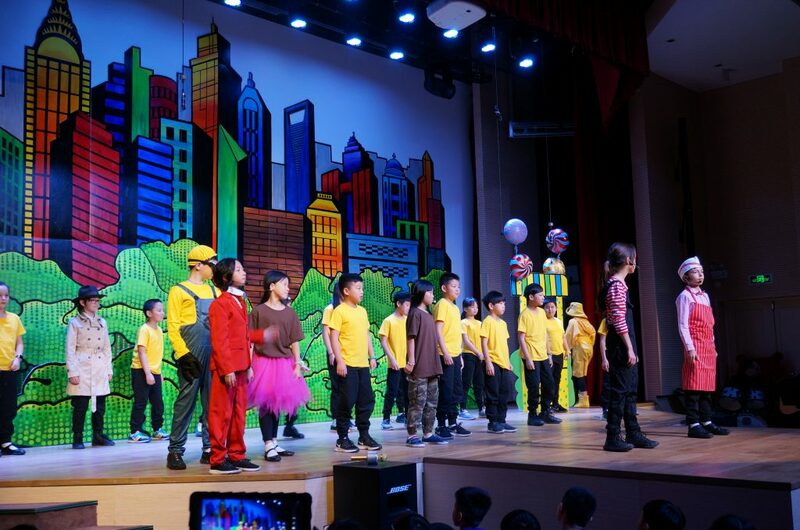 The Pudong Campuses of YCIS along with Yew Wah Lingang and Yew Wah Kindergarten in Pudong, converged on Century Park Campus for our section of the conference. 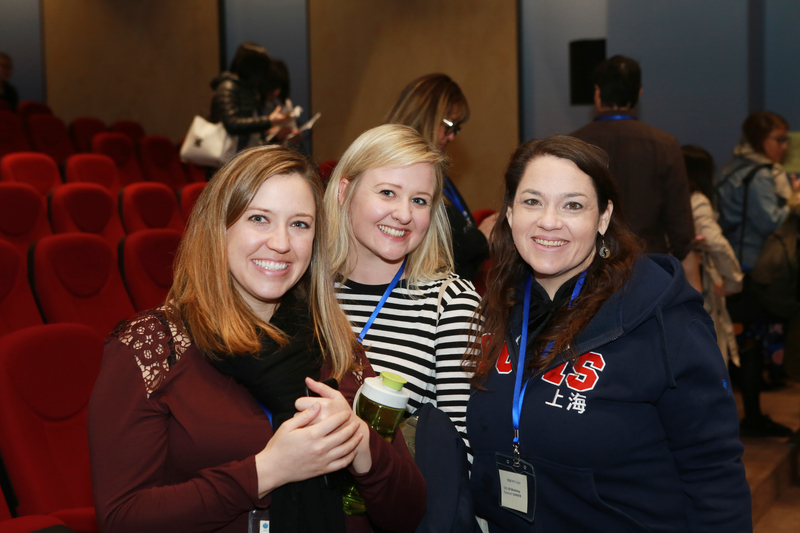 In total there were 300 educators meeting over the two days. During the first day, teachers were able to attend a variety of teacher-led workshops on topics such as reading, co-teaching, communication with parents, technology and growth mindset. 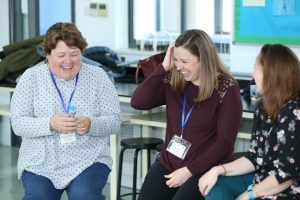 Some of our teachers and non-teaching staff also participated in First Aid Training. 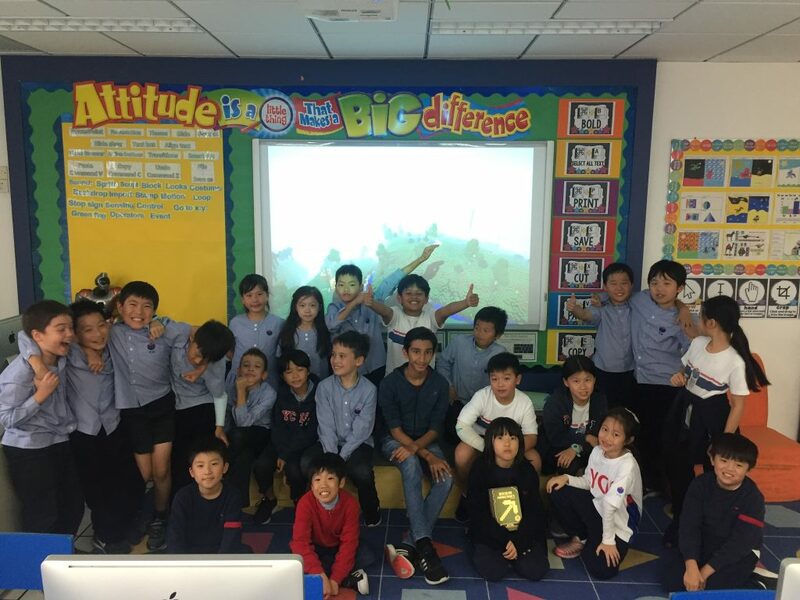 On the second day, we used video conferencing links to connect with 1,200 other colleagues from the global network of Yew Chung International Schools (YCIS) and sister schools, Yew Wah International Education Schools (YWIES), who gathered concurrently in five other cities around China to focus on the future of education. Several education specialists were invited to share their expertise at the conference providing keynote presentations on topics such as Differentiation, Technology (robotics and artificial intelligence) and our unique ECE programme. “The fact that there is not only one school but many other schools working in the same direction is quite powerful. 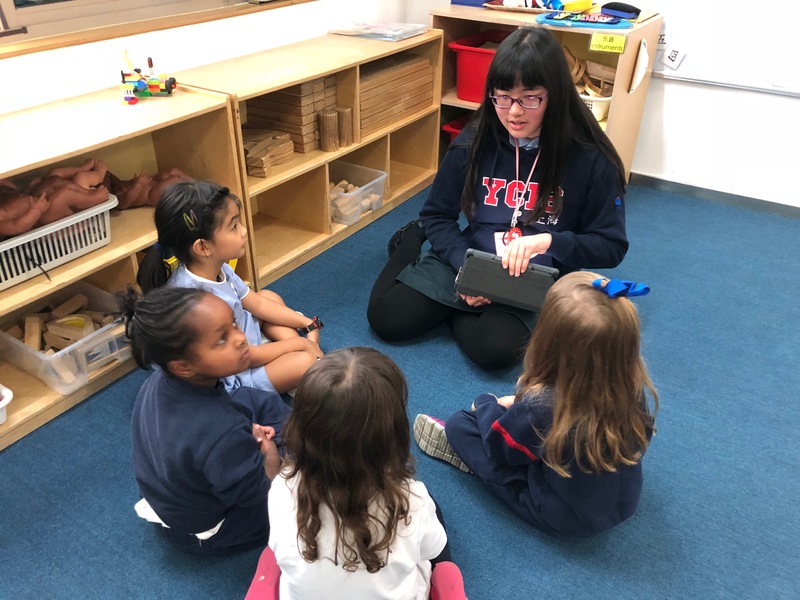 Meeting people from other schools having the same fundamental values was also very inspiring.” YCIS Pudong Community Relations Officer Roseline Yang. 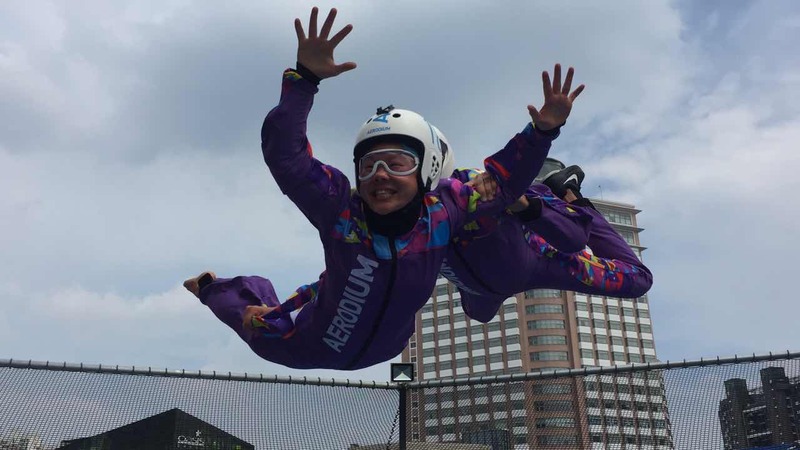 “‘Reinvention’ is precisely our call to action. This is our opportunity to reinvent education. As we gather here to celebrate our 85th Anniversary, we come together to lay the future direction for the education of our children. 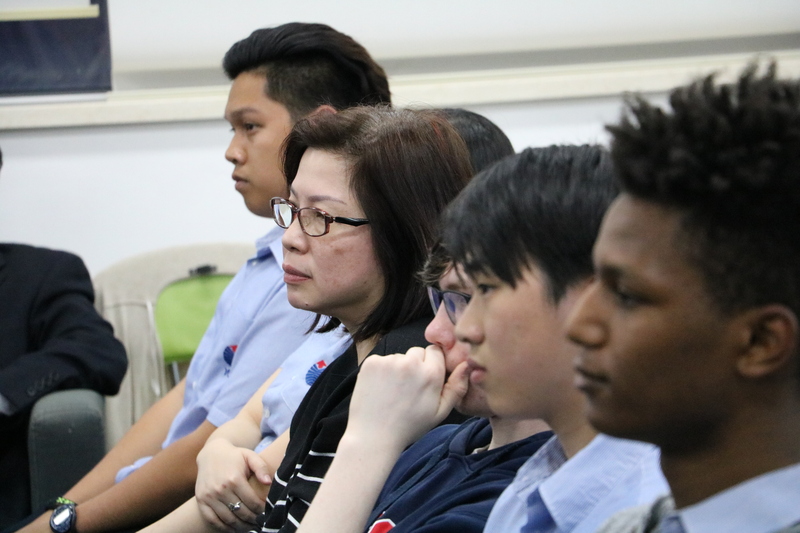 The existing pedagogy, methodology, and content should be modified to equip the next generation so that they will become the leaders of tomorrow.” YCIS & YWIES CEO and School Supervisor Dr Betty Chan said during her Conference opening address.